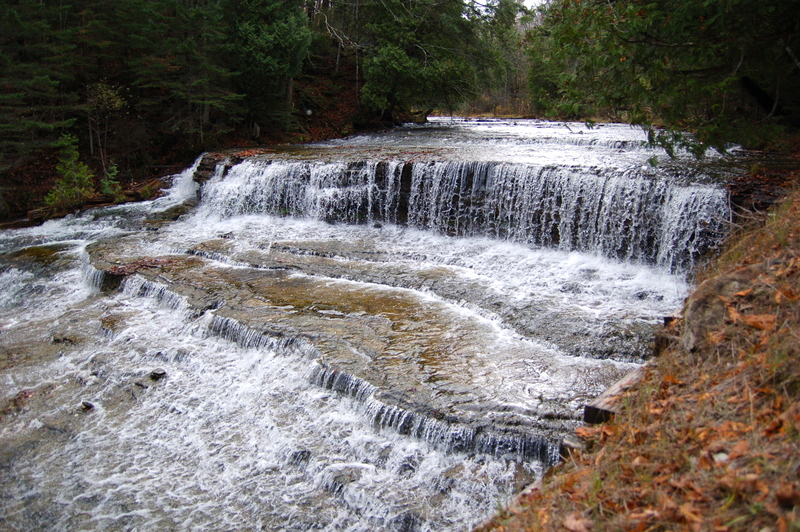 Alger County could easily be referred to as the waterfall capital of Michigan thanks to its numerous high-profile drops in Picture Rocks National Lakeshore. 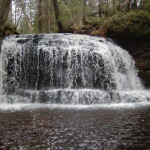 Unfortunately, many visitors focus their time on the well-known falls near Munising and miss out on some true gems in the southwestern part of the county. 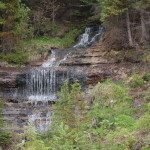 A waterfall worth checking out that isn’t too far out of the way is Au Train Falls, a set of two drops on the Au Train River that can be reached by heading south on M-94 from Munising. 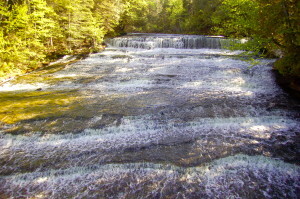 The river has been dammed above these falls, and the water level here can fluctuate greatly based on how much water (if any) is being let out. 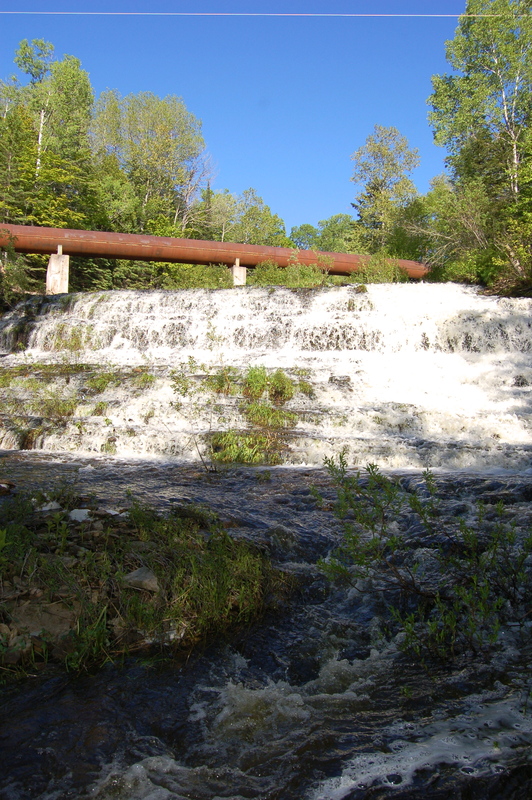 Another fortunate consequence of the dam and power station is the large pipe that runs above the upper falls, spoiling what would otherwise be a stunning view. 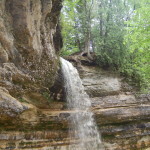 A rough trail leads down to this 40-foot drop, and it can be a muddy and buggy descent. 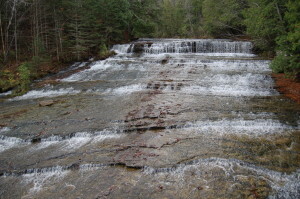 The lower falls is a set of drops that slide down mossy brown and yellow rock, with the largest drop being no more than 10 feet. 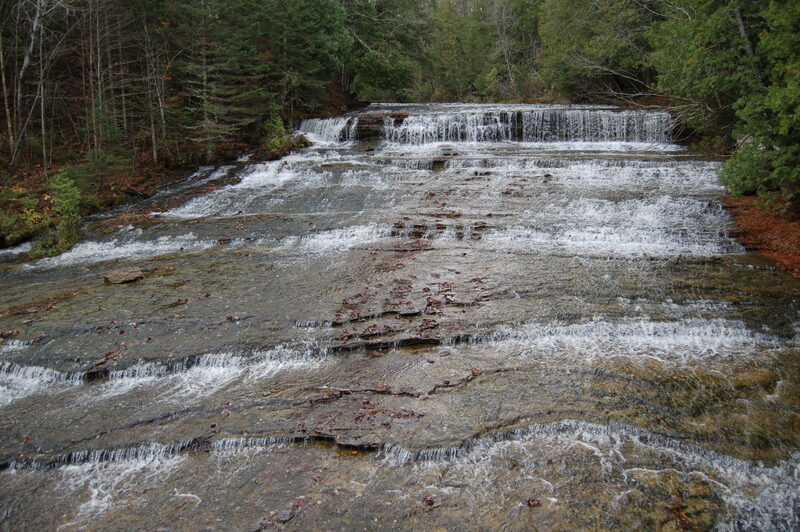 When the water level is low, it is easier to see the definition in the rock. 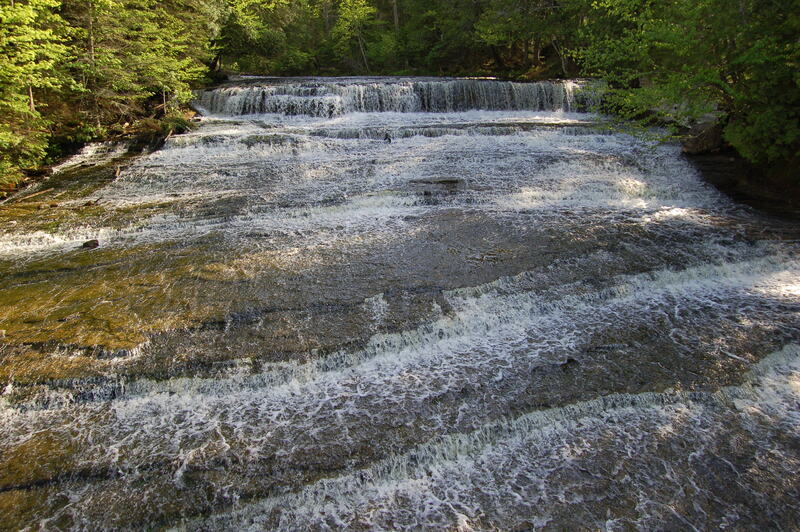 At high water, the rock can almost seem to disappear. 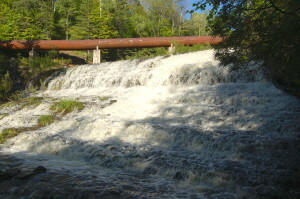 There is a footbridge below the lower falls, and a small powerhouse. 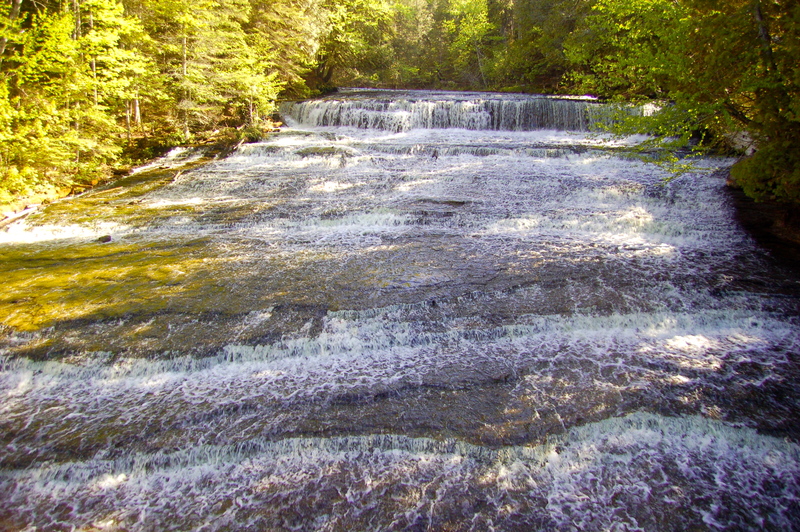 It’s not often that you can see two stunning waterfalls like this in one location, and while the upper falls is larger and much more wild looking the lower falls are special in their own way. It’s definitely better to visit this waterfall in the spring or after a heavy rainfall, but be aware that thanks to the dam there are periods where there may be little or no water here. 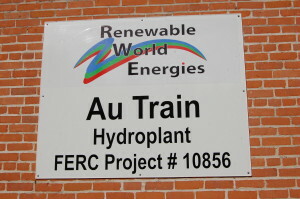 Directions: From Munising head south on M-94 for about 15 miles, then head north on CR-533/Au Train – Forest Lake Rd. After a couple hundred feet there will be a sign for the falls and a dirt road to the right, take that and follow it to the parking areas for the upper falls (first) and lower falls (second). 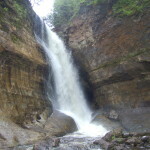 It is less than a quarter mile walk to either drop, but sturdy footwear and plenty of bug spray is recommended. 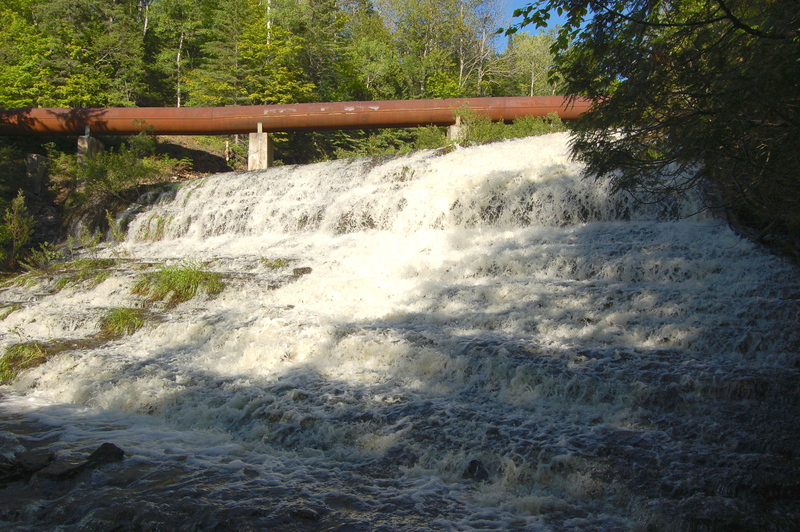 Wagner Falls and Alger Falls are back near the intersection of M-94 and M-28, while Laughing Whitefish Falls is to the west on M-94.